When I was 16, my dad taught me to drive. He’s not the most patient of men, so I can’t imagine what he had to do in order to hold himself together to prepare my scatterbrained, teenage self for life on the open road. One Saturday, without telling me what we were doing, he threw a big, barrel-sized trash can and a broom in the back of his car and then we drove in two separate cars, mine and his, over to my high school. He parked his car neatly next to the curb of the school. Then he pulled out the trash can and broom and placed them carefully two car-lengths behind his car, the broom sticking out of the can, waving jauntily, still next to the curb. Carefully and patiently, he explained to me the fundamentals of parallel parking – pulling up to the mirror of the front car; turning the wheel, backing up almost perpendicular to the curb; then at the critical moment, turning the wheel to slide the car sideways into the spot, landing inches from the curb. “Now parallel park your car,” he commanded. We were there for two hours and I parked the car and un-parked the car, perhaps 100 times. He kept moving the trash can with the broom sticking out of it closer and closer to his car. I had to get in and out of tighter and tighter spaces. On that sticky, hot day in August in Connecticut, my dad could not have known that he was preparing me for a life in Tokyo twenty-something years later. But check out the photo above, which shows the front of my house and my parking space, which requires me to parallel park every time I use the car. That particular photo is on trash day when mine and my neighbor’s trash cans are out front ready for collection; normally they’re not there. The bikes behind the car belong to my children, however, and they are always right there. 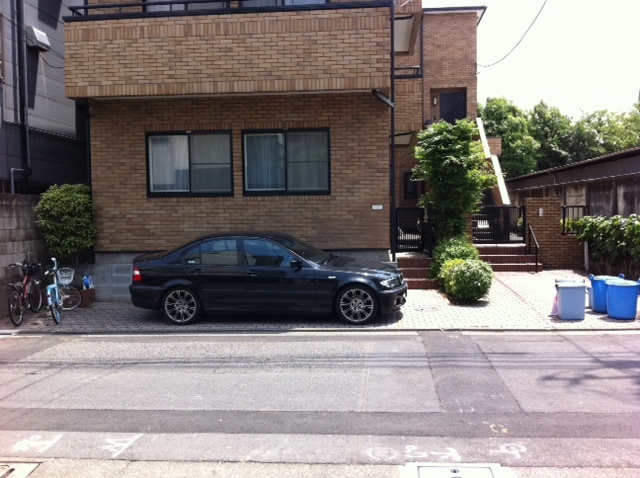 Granted, in Tokyo, I don’t use the car all that much – it can sit, unused, for days on end. On the day I took the photo, I had just come home from a quick grocery run and despite trash cans and bicycles, slid the car easily into the parking space, getting the car perfectly parallel to the house on the first try. As I always do in situations like that, I thought of my dad with a smile. He lives in Florida in the U.S. and misses me – er, mostly his grandchildren – a lot. But he’s very much part of my every day life, even if he’s not here to see it. I did not appreciate the lessons at the time – I was hot and tired and cranky. But he persisted, thank goodness, and we are both winners for it. In case I forgot to say it then, thanks Dad. This was such a sweet post to read on a Monday morning – sometimes we do not realize the lesson at the time, but not to say we did not grasp and keep it…. you’re a good example of that. 🙂 Nice to see you did not forget those days. What a great story. I bet he does miss you.